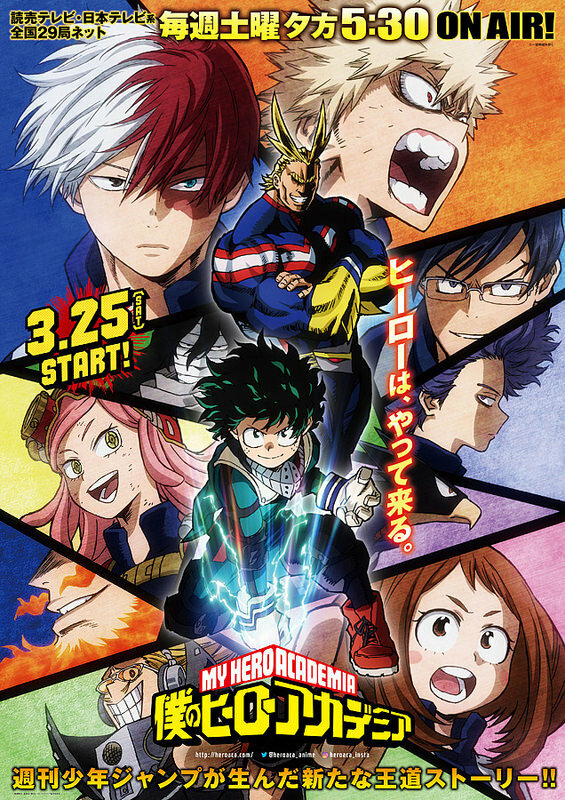 All right, it’s time for the second season to the hit show Hero Academia! The first season really took off and this one naturally followed it with the same excitement. I especially recall seeing it get a lot of buzz when the season first started and I’m sure it held on throughout. On the whole I’d definitely consider this season to beat the first one. It had time for more intense fight scenes and both halves of the season were really solid. I’d argue that the first half beat the second but they both had their share of good scenes. We start off the season with a bang as the tournament starts. First we get some random events in Olympic style as various teams clash. The episodes are a lot of fun and we get introduced to some new characters like Neito who are extremely good. Once the real 1 on 1 phase of the tournament starts, then things get real. The main highlights of the tournament are Bakugo vs Todoroki and Deku vs Todoroki. Those two fights were leagues better than any of the others in the bracket although that’s not to say that the others were bad. These are just the matches that I had been waiting for. Deku’s had less action than Bakugo’s so it would come in second, but I was glad to finally see him using his powers more. The dynamic between the characters is also good since any of the 3 can make a claim for being the strongest in the school. I’d say that Deku should easily beat both of them once he gets Full Cowl, but the tourney ended right before that so I was fine with him not being able to match the other two. 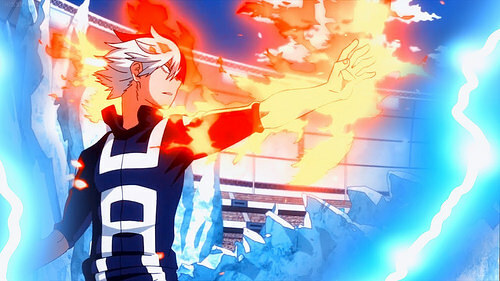 If Bakugo and Todoroki both fight at full power my money would be on Todoroki, but if Bakugo can use his speed a little more it could definitely go either way. Then we get to the plot heavy part of the season where the League of Villains attacks again and Stain is around as well. 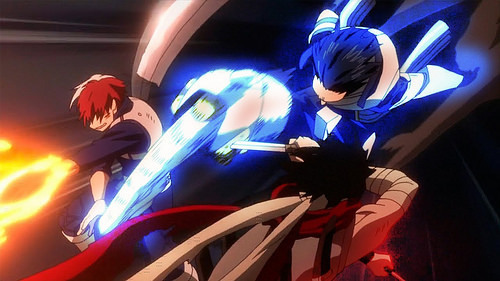 It was the best part of the season to be sure as we got to see Deku, Iida, and Todoroki take on Stain. It’s known as one of the best parts of the season and it’s easy to see why. It stays exciting throughout the whole event and it’s almost hard to go back to the happy days after that. Still, the show manages to pull it off since the directing is quite good and even normal scenes usually feel pretty hype here. I do think that the season should have ended on a more exciting note though. We get the big teacher vs student battles with All Might taking on Deku and Bakugo towards the end. He certainly wasn’t pulling his punches as much as you’d expect and it made for a really good showdown between them. That should have been the final episode as opposed to ending with Shigaraki getting in some threats and Deku being humiliated again. It could have been a worse ending as we at least got to see new villains, but maybe it just didn’t help that I’m not too impressed with them yet. There’s plenty of time for them to change my mind in the next season. I’m confident that season 3 will continue to improve the series as it’s going to be adapting my favorite arc in the series. Prepare yourself since it may even manage a 9/10 for that one if it plays its cards right. Well, lets look at the characters. Deku is still a good main character. He was quick to divert from his main mission to go save Iida when he suspected something was wrong. A hero should always be ready to take the initiative like that after all. In his fight with Todoroki he also did a good job of talking sense to him. I don’t care much for his quirk of muttering to himself but it’s not overdone to the point of annoyance so it’s easy to overlook. Deku really just had two problems in this season. One was when he let Shigaraki get the drop on him and just threaten him for a while. It’s moments like those where you have to use Full Cowl and just blast him off. Especially once he started to get choked. That scene was just brutal for Deku fans because you’d expect him to at least do something. Anything is better than just losing like that. The other iffy moment is when he is teamed up with Bakugo against All Might and keeps saying that they should run away. Running is never the answer and against an opponent whose main ability is super speed and strength…just doesn’t seem like a good option. I was completely with Bakugo there as the best defense is a good offense. Just fight All Might and claim victory. As the heroes always say, it doesn’t matter who your opponent is as your mission still doesn’t change. You just have to win, that’s the end goal. If they had fought together from the start they probably would have done a lot better. Todoroki finally gets a lot of development here and he’s still my favorite character. He did a really good job in all of his fights and finally knows that he should always be willing to use his fire. He was the only student smart enough to find Deku in time and does a good job of living up to his rep as a genius. It’s a shame that he doesn’t do much in the future arcs since he has such a nice role here. He’s extremely powerful and dependable. You can’t ask for much more from a character. One issue with the heroes taking on villains though is that the main 3 are really the only ones who can fight. I suppose Iida has some combat ability as well, but the kids are just so far behind right now. Uraraka is a fun heroine, but her gravity ability doesn’t really have a whole lot of combat potential. That’s why I’m glad she’s at least learning some hand to hand skills from her mentor. That should make up for her powers and maybe she can find a way to use the two as a combo. Light gravity on herself should allow Uraraka to engage in faster hand to hand combat battles potentially. Hopefully they can do something like that for her. This is Iida’s final big moment before his character falls down the tubes so I recommend enjoying it. His quest to stop Stain was pretty good, it’s a shame that he just didn’t have the power to back it up. Stain’s simply too fast and Iida is bad at changing directions. It also admittedly wasn’t his best moment as a hero since he didn’t even think about saving the other guy in the crossfire. I would give him a passing grade for the season though since he at least had a good plan for telling Stain. I probably wouldn’t have told the other students either since they would really be in danger at that point. Tsu gets her own episode but it’s probably one of the weakest in the season. It’s about her helping out on a boat which isn’t bad…but pretty much the definition of filler. It’s definitely fun for her fans and all, but the “veterans” on the ship looked like chumps when they were just thrown overboard like that. They really didn’t expect the villains to try and pull a fast one? That’s a little sad for them if that’s the case. Tsu also can’t really fight so hopefully she’ll get a second power soon. Momo gets some more development as her battle with self confidence happens during her match against the teacher. She’s a cool character and I think the series can do a lot with her ability. Being able to create anything that she understands is certainly handy. It’s surprising how often she just never gets to appear but maybe that’ll change soon. Kirishima doesn’t have an especially large role here or anything, but he’s still a fun character. His armor ability just has too many limitations at the moment so he really needs to improve it. What’s the point of super strength and durability if it’s only to a mild degree? At least he has enthusiasm. Kyoka also has a mild role, but she looked really good. At least she’s always ready for a fight and is a capable strategist. She contributed in her battle against Mic with her cool ear drum abilities even if the self damage is a little too high for it to be worth using very often. Tokoyami is also another solid fighter who uses his dark hawk ability and his mind to outsmart the enemy. He’s treated as one of the strongest students and I guess he would be top 5. He’s a cool character that I wouldn’t mind seeing more of as well. Finally from the main students there is also Mineta, but he is the worst by far. There’s just nothing cool to say about him and he is only here to try and bring in some fanservice. The show is really good about avoiding that trap for the moment so getting rid of him and Midnight would make the show completely stay away from it. Mineta has his own big scene which is terrible and unnecessary so hopefully we don’t go through that again. The other classes have some pretty interesting students as well. Neito is easily one of the best as his character exists only to make fun of the main students as he reminds them that talents, not quirks win battles. He actually does really good during the opening events. Considering that he has no powers, the guy really makes an impact. I hope to see a lot more of him as he’s the kind of comic relief character that I can get behind. Mei is a tech student who invents a bunch of stuff. She seems to be a fun enough character although none of her inventions seem like they’ll be enough to help her in a real fight. She’ll definitely have to stick to the support role for a little while longer. Hitoshi can control people if they talk to him which is certainly a very good ability. After all, as long as he doesn’t let everyone know about that, most villains will automatically talk to him for trash talking and the like. How useful this ability is will directly correlate to how well he can keep a secret. Just keep releasing fake truths to how it works through the news and such and he could be a secret weapon. It’s just a shame that this kind of ability never seems to work on the stronger opponents. There’s not much to say about the teachers. Aizawa still serves as the Kakashi of the series and reminds the kids that you can’t mess with the adults. I don’t buy into him doing well against Todoroki at all, but being able to turn off a person’s quirk is really handy. The no blinking rule isn’t nearly as useful though since it should be easy to make him blink during a scuffle. He needs a stun gun or something. Principal Nezu is pretty cheap as per usual. I still hold onto my pet theory that he’s a traitor as it would at least give his character a purpose. I actually like Mic. He made for a pretty good opponent during the battle and had a lot of fun with his exam. His ability is a little overpowered for how the test was structured though. Ectoplasm has a really cool design even if he hasn’t done much yet. Having Shadow Clones is always handy as well for dealing with multiple opponents. I hope he is either really fast or has some hand to hand techniques though. Snipe has a gun and he knows how to fire it. The guy didn’t get to do much in this season though. Midnight’s hormone abilities definitely make for one of the most underwhelming quirks. It’s almost as bad as just having a tail, it’s not going to help against a serious villain. 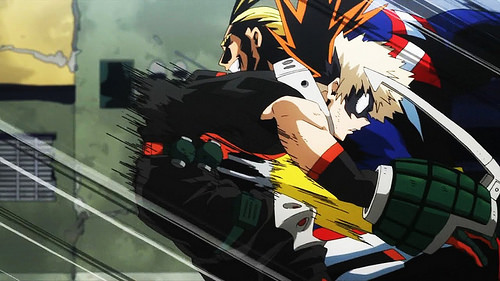 All Might’s fight is pretty good and while that’s basically the extent of his role here, it’s a pretty good one. It’s good that he didn’t go too easy on the kids because then there wouldn’t have been much of a point to the exercise. I still really like his super hero design even if the frail human mode isn’t nearly as exciting or fun to watch. He embodies what it means to be a super hero and that’s why it’s easy to see All Might as the symbol of hope. He’s starting to keep some secrets from Deku, but nothing massive yet so it’s all good for now. One thing that’s always annoying though is how the grown ups tell the kids not to make the hero call. The heroes being in trouble for helping stop Stain is pretty awful no matter how you look at it. Sure, they weren’t given permission to use their quirks and such but I thought you were allowed to do that if it was an emergency. I feel like that was mentioned in season 1 and this would count. Now they have to pretend that they never helped in the first place which is pretty bad. I’ve seen similar speeches in many shows and I never agree with them. If you’re in a position to help someone but don’t have a license, you still have to act. There’s no time to go and find someone and being a hero means saving lives over following the rules. The heroes need to work on a better system so they encourage other heroes to help instead of stopping them. Considering that most of humanity has quirks in this series, they’d be a force to be reckoned with if they united instead of being forced to hide their quirks. The League of Villains didn’t do much yet. One of the few weaknesses to the series is that the villains aren’t very interesting. Stain is really good and Kurogiri/Noumu have cool designs. Beyond that, the rest of basically throwaways. It’s hard to take Shigaraki seriously when he’s always grabbing his face to calm himself down. His power is actually very useful but his personality just doesn’t work as the big leader of the villains. He needs some self confidence or a better design at the very least. Kurogiri looks cool and his power is great. He should just overthrow Shigaraki at this point since he seems more qualified to be leader. I’d definitely like to see more of him since he is easily the most interesting villain right now. Since there are many Noumu running around now, they are far weaker than the one that fought All Might. It’s too bad that they got nerfed but at least they are still a credible threat to an extent. We get quick cameos for Dabi and Himiko at the end. They will do more in season 3. Considering that they seemed threatened by Shigaraki at the end, their hype is basically gone by this point. I can see why Himiko is a fan favorite since she’s totally crazy, but it’s just not in a cool way. Dabi is fine though and I expect good things from him. Stain is the big villain of the series and he is certainly as cool as you’d expect. He has a great design and his ability is also very handy. Being able to paralyze someone for a few minutes is downright amazing. In a 1 on 1 fight that is an instant game over for basically anyone. No matter what your quirk is, you’re not going to be able to survive for long if you can’t move. I’m pretty sure you can’t even use your quirk while paralyzed although I’m sure there are probably some exceptions to this rule. Since Stain is still alive, I’m definitely expecting him to return at some point. Whoever the show has hired as the director definitely needs to stay on. I take a lot of shots at Naruto Shippuden, but that’s because I wish it was a show like this one. Basically every scene is interesting and the characters are mostly all fun. Each episode is over in the blink of an eye since nothing drags on and you don’t keep seeing the same flashbacks. Even though the manga starts to go downhill a little after where season 3 should end, I’m hoping the anime can save it somehow. With this team at the helm I do think there is a chance. It’s one thing to adapt the source material and another to make it even better. This show is one of the latter and this is basically the prime of the series so continue to enjoy it now while the going is good. As you’d expect the animation is really solid for this season. The colors really stand out and everything is very sharp. You can especially see this in the high budget episodes. I’m glad the show got a good budget since just about every character has some kind of energy element to their abilities and you need to be able to show that off. One look at the episodes and you know this is a modern show. The soundtrack is basically the same as in the first season. It can be kind of nostalgic but I hope they add some new tunes for season 3. It’s a good soundtrack, but you should never be satisfied by just reusing old themes and should always incorporate new ones as the series progresses. I wasn’t too impressed with the new openings visually, but I did like how they sounded. The very first opening is still the best by far though. That one’s iconic at this point and is one of the best no matter what opening you put against it. Overall, This was a great followup to the original season. It worked out well that we got another big villain arc here like in the first season. The first season may have done a better job of being really tense since the kids still hadn’t really mastered their powers yet. It went from happy to serious in the blink of an eye there and it was one of the best moments in the series. On the other hand, this season embraced its nature as an action series more and really stepped it up with the fights. For example, the Stain fight here beats anything that was in season 1. The characters were already developed a lot so now getting to see them fight is even more satisfying. It’s a really solid action show that I can recommend to anyone and it’s not complicated or anything so it’s very easy to start. This entry was posted in 8 Star TV Shows, Reviews, TV Show Reviews, TV Shows and tagged Action, All Might, Anime, Anime Review, Deku, My Hero Academia, Review, Season 2, Sequel, Shonen Jump, TV Show Review by dreager1. Bookmark the permalink.